What do you really know about Palestine? I’m betting for most of us that’s not much beyond the headlines of conflict over borders with Israel. In this ‘year of the Arab Spring,’ I wrote a series of reviews of books about Arab countries in the Mid-East and in northern Africa, which started with the linked article. I never happened upon just the right book for Palestine. Belatedly, I’m remedying that oversight with a book about a different kind of walking tour. Personally, I have traveled in Israel, and peered over the border into Palestine, but I admit that I would never have considered the West Bank in Palestine as a place for a leisurely stroll. And I had no idea of the stunning scenery, or the ancient sites from biblical times, through Roman, Crusaders, and other waves of invaders. But once I followed the maps and looked at the photos in this book, I understood that the pictures of conflict we see are of the narrow band along contested borders and Jewish settlements. Beyond the ugly walls and gates and armed soldiers, there are towns and villages and farms, wadis and hills worth visiting. While authors of guidebooks are frequently anonymous to the reader, this book came about because of a very dedicated walker and author, with attributes that give us tons of extra value. Stefan Szepesi walked for enjoyment when he lived in Jerusalem from 2006 to 2010, when he is not working as an economist and consultant to diplomats, including Tony Blair. His background guarantees a deep knowledge of the political situation and history of the area. Although he is back in his native Rotterdam, he continues to return to Palestine. However, there are aspects of this book that many Palestine solidarity campaigners are going to find difficult to swallow. The first clue is the endorsement on the back cover from “the Right Honorable Tony Blair,” a war criminal masquerading as a peace envoy, who has failed to stand up to Israeli settlement-building and other abuses of human rights and international law. During the time that Szepesi lived and walked in that area, more diplomats and even leisure tourists began to explore the possibilities of walking in Palestine as some areas became easier to access. Even though the Palestinians generally still do not view walking as a pastime, a few tourist facilities are opening, hiking clubs have formed and some trails now sport markers. 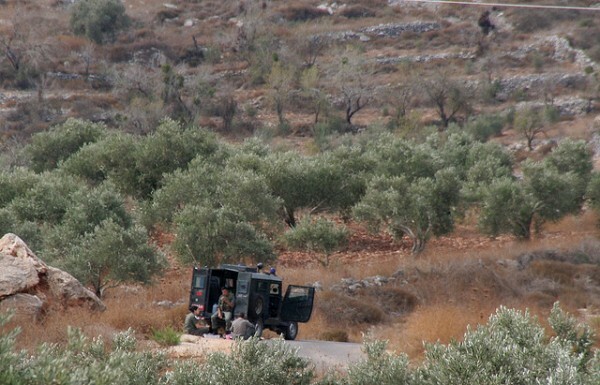 Palestinians pick olives while Israeli soldiers, there to guard the border with an Israeli settlement, eat their lunch. See more information by clicking on the photo to go to the page of Michael Lodenthal on Flickr. Walking is not a risk-free activity anywhere and neither of course is walking in an area of conflict. 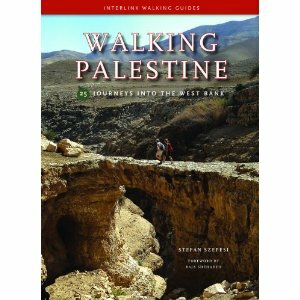 While the walks in this book deliberately avoid areas that have served as flash points for tensions in the past, it is important to be aware of the overall security context…where all of the trails described in this book are located, the conflict has transitioned form a surge in Israeli-Palestinian violence in the early 2000s…to a conflict of low intensity. 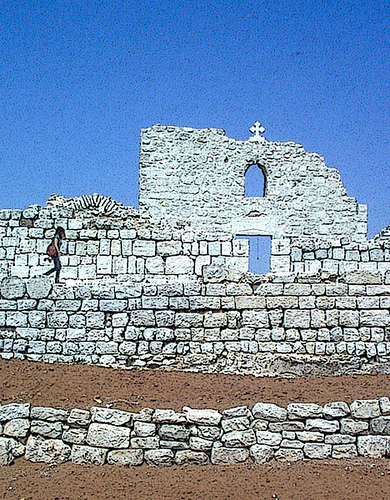 …impressive ruins (that) include a Roman theater, basilica and forum, a Byzantine church, a Herodian temple, Hellenistic defence towers, a cathedral-turned-mosque and buildings from Ottoman and Crusader times, among others. This collection of attractions in Sebastia, that includes a street of columns through the middle of town–the remains of Roman construction, would draw millions of tourists each year were it located just about anywhere except Palestine. Start Coordinates N32 16.622 E35 11.617. Then the author gives detailed descriptions of the trail by small hunks, including very specific instructions for route finding and notes on interesting things to watch for. These trail description pages are liberally illustrated with beautiful color photographs. When there is a particularly interesting historical or cultural note, a page or section printed on yellow paper interrupts the straight hiking directions. For instance, this trail follows an old railroad track, whose history deserves a page of description, since it was built by the Ottomans, meant to go from Nablus to Damascus, and destroyed by Lawrence of Arabia. We read descriptions of two more trails in the Sebastia area, and then get a section with local logistical information–how to get there, where to find guides, where to park, eat and sleep, and additional sites to see or festivals to attend. This is also where you learn about other sources of information. At the end of the book you find a helpful glossary of terms and a short Arab vocabulary. Throughout the book, the Arab script for place names is included in case you’re looking for signs and they don’t appear in English. Honestly, I could not think of another thing to include in this book, with the exception of an index. I came away with a new appreciation for the value of Palestine to the traveler, as well as much more knowledge of the people and the country than I have from shocking headlines and pictures of the Wall. If your interest in the Palestine and Israeli area principally focuses on following religious figures, here are some suggestions. According to one article on the web, Szepesi now works for Abraham’s Path, an organization he mentions in the book. And then there’s the Jesus Trail. 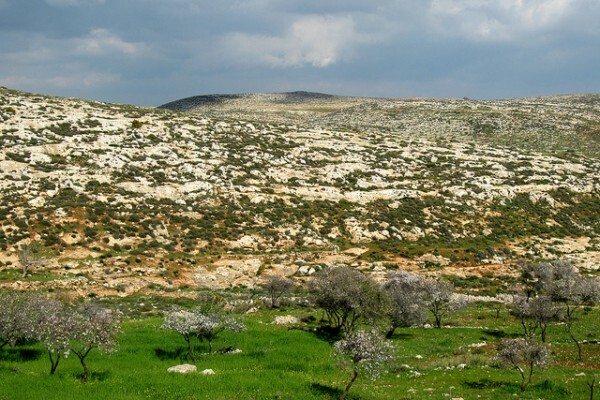 The Jesus Trail provides 65 km of Biblical trail, with 220 km of additional trails connecting to sites, villages and cities connected with early Christianity. Or check The Alternative Tourism Group, who also help organize a Nativity Trail from Nazareth to Bethlehem–160 km, about 11 days. And here is a post on how to get to Ramallah and a discussion of politics in the region from the blog of Adam Groffman, Travels With Adam. Tell me, would you consider going on a hike in Palestine? What’s your comfort level? What would attract you, or repel you? Disclaimers: This book was provided by the publisher for review, but the opinions are my own. The photos come from Flickr and are used with a Creative Commons license. I know it would be a fascinating place to visit, but I’m not sure if I’d be game. I’m wondering, did you feel like the author’s list of “do’s” and “don’ts” was enough? What I mean is that it does sounds like a walking tour would be risky, especially if you got lost. Does he give enough cautionary information that you could pull of a reasonably safe hike through the area? Kristin: I though he did indeed give all the information needed. Beyond the dos and don’ts list,he cautions when paths may be difficult to find and he provides both easy-to-navigate trails that follow marked trails–or even roads and streets– as well as more difficult route finding, so you can decide for yourself whether your skills are up to the task. But most importantly, he stresses that he ONLY writes about areas that are currently safe to travel and have been for some time. Since he has been intimately involved in the diplomatic issues, he knows what he is talking about. Hey thanks for writing about Palestine. It’s a region I’d love to explore more and I think the next time I visit I will definitely try to do a walk. Thanks for the suggestion! Those photos are lovely. I’ve never been to the region, and would love to go. But find myself holding off. Reading is the next best (or perhaps the best?) this. This is amazing. But, like your other commenters, I think I’ll content myself with reading about it. Unless everything changes dramatically for the better. That would be wonderful, but I’m not counting on it. What a great idea for a book to help encourage and open new areas. Like many, I’d still be nervous about exploring the area on foot. I’m with some of the other commenters. Just too much to worry about with a trip like this for me. While I do want to learn more about other cultures, always, I’d prefer to do so in a less risky environment. Wouldn’t it be wonderful if we could visit any country we wanted without having to worry so much about our safety? Like Sheryl, I’m sure it is a lovely place filled with history, which I love. But I could not visit due to the on-going conflicts. I’m just not into that type of adventure travel. I am quite sure it is filled with beauty and history…but call me a scaredy-cat…(sp?) I’d rather look at photos. Although I do fully realize that anything can happen anywhere, walking in a place of conflict does have its risks. What an amazing experience that would be. I would love to explore so much of our early Christian history and experience for myself a region that you only ever hear skewed media coverage for. Thanks, Tracy. Certainly the only way to learn about most places is to GO there! I hope the Arabic script is large enough to read. I am continually frustrated by 8-pt squiggles when I really need a large, bold display in order to distinguish the unfamiliar letters. Their script is utterly beautiful and I would not have them change a thing, but we Westerners need all the help we can get and it would be nice if our own handbooks would be mindful of that. Good point, Davis, and I went back and checked. The script shown with place names in the main part of the book, seems bold enough, but I wish they had included more place names in Arabic script. The script in the vocabulary section would be difficult to make out, I think, but really you’re going to be trying to say and hear rather than write, so anyone wanted more than a brief traveler’s vocabulary would have to go elsewhere anyhow.